Cutiefly in game: 760 Who? Important notice! Pokemon Cutiefly is a fictional character of humans. Cutiefly (Japanese: ?? ?— Abuly) is a dual-type Bug/Fairy Pokémon introduced in Generation VII. It evolves into Ribombee starting at level 25. 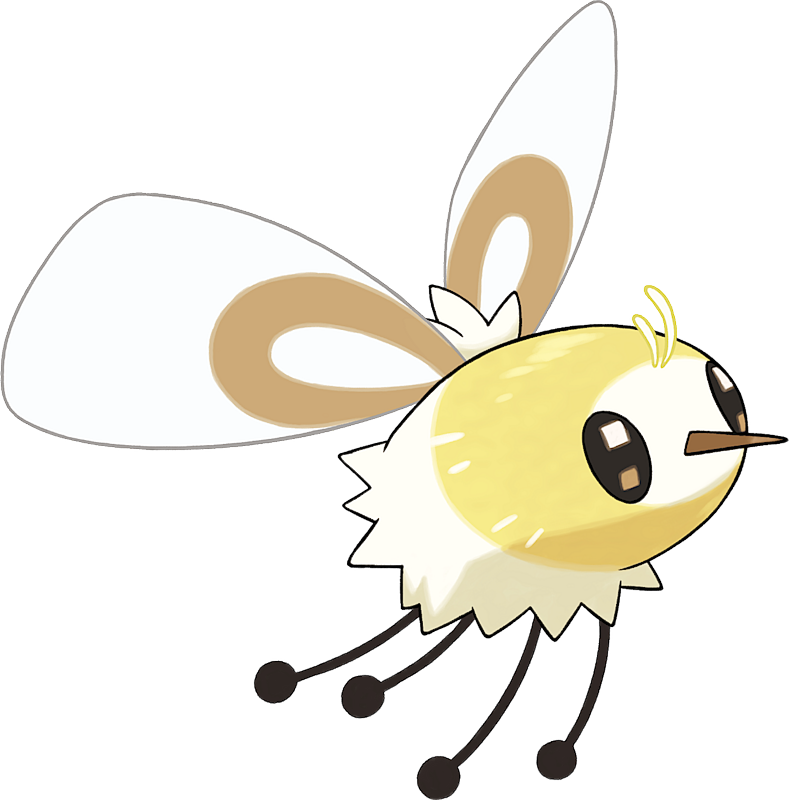 Cutiefly is a tiny Pokémon with comparatively large wings. It has a pale yellow body with a white face and tail. It has large eyes with spots resembling pixels in them, a long brown nose, and two tiny transparent tufts on its head resembling antennae. The wings on its back are wide and flat. They are white with brown loop markings toward the bottom and have a white tuft of hair between them. It has four spindly legs with round feet. Cutiefly is capable of detecting the aura of living things, such as plants, people, and Pokémon. It collects nectar and pollen from flowers, which are found by the color and brightness of their auras. However, when a living creature is excited, its aura resembles flower in full bloom. As a result, Cutiefly tends to gather around beings feeling strong emotions. This Pokémon can be found in fields and meadows, but is sometimes attracted to towns or buildings by the emotions of living beings. Moves marked with a superscript game abbreviation can only be bred onto Cutiefly in that game. No other Pokémon has the same type combination as Cutiefly and its evolution. Cutiefly and its evolution are the only Pokémon to have the Egg Group combination of Bug and Fairy. 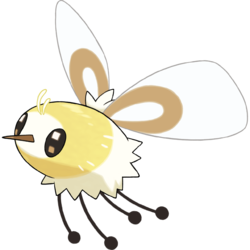 Cutiefly is tied with Joltik, Flabébé, Comfey and Cosmoem as the smallest Pokémon. Cutiefly appears to be based on the bee fly. Cutiefly may be a combination of cutie-pie and bee fly. Abuly may be a combination of ?? tsuriabu (bee fly), lovely, and ??? ?— fairy.